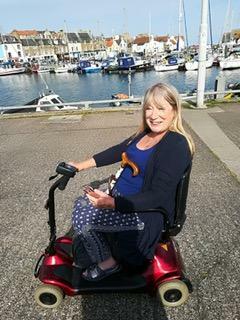 I feel about my outside walker or rollator, as us in the know call them, as I did about the leaflets i was given when I had breast cancer in my thirties. They had older women with grey hair on the front of them. The nurse touched my hand as she gave them to me and I wanted to slap her face with them. I then spent several hours speculating on how I could shred them and post them out the slatted windows at the top in my room in the hospital. It was on the tenth floor, no one would ever know. In the end I didn’t, mostly because I couldn’t reach! Back to the walker.....it’s clumsy, heavy and brown. And I hate it. For many reasons. I hate it because I can’t walk any distance anyway and it reminds me of that. I hate it because I need help to even get it out. I hate it because it’s ugly and my heart sinks as I approach it. I hate it because I feel disabled by it. I hate it because it reminds me of how I really am, not the version in my head still. And being honest, i hate it because it feels like something an older person should be using and I’m still only a youthful 62! I’ve looked at snazzier versions and they are slightly better but the truth is I still can’t walk far or easily and I’m not keen to make an expensive mistake. So as a fan of an asset based approach I’ve been focusing on what I can do. I can get to the Royal Botanic Gardens in Edinburgh on my own in my mobility scooter. Not everyone believes that you are really disabled when you are in a mobility scooter. Maybe we just don’t look ill or meek enough, who knows? But what I love is the look on children’s faces. They reflect how awesome this is and they would really love one too! I’m thinking about pimping it up a wee bit. Maybe just a bairns not bombs sticker if anyone has one handy? A good friend was staying to look after me at the weekend and we went out for dinner locally. On our way back we got some good humoured attention from a man who had a walk that suggested he wasn’t quite sober. And the next day we rescued an elderly man in a mobility scooter who was lost; forming a mobility scooter procession that must have been quite an entertainment. He got home safely, saying thanks and that it had made his day to meet two beautiful women. I remarked later that when she came out with me in the scooter we got chatted up! Her rather harsh reply was reminding me that one of them was drunk and the other was aged 100! As always your blog makes me laugh and makes me thoughtful. Like the scooter photo...you look like your waiting for a cocktail !! Congratulations on becoming a grandmother Audrey - this will give you a whole new lease of life!